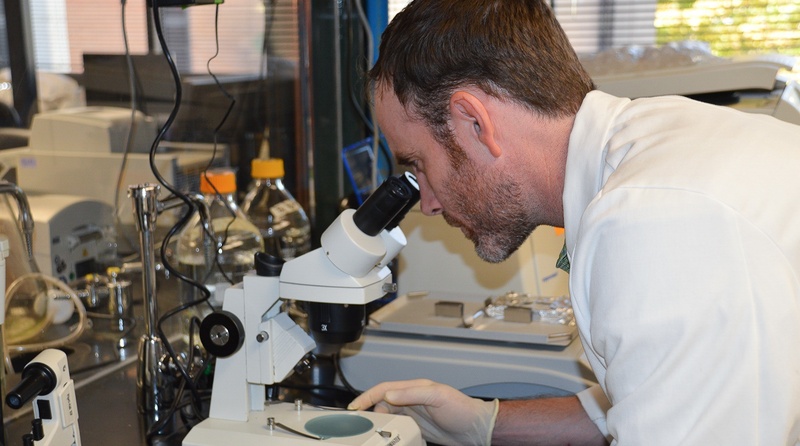 OMRF researcher Bob Axtell, Ph.D., has received a five-year grant from the National Institutes of Health to study a rare autoimmune disease called neuromyelitis optica (NMO). The grant, awarded by the National Eye Institute, will provide Axtell with $2.8 million to study NMO and investigate its similarities to other autoimmune diseases, especially multiple sclerosis. NMO, like all autoimmune diseases, occurs when the immune system attacks its own healthy tissues as if they were harmful invaders. In the case of NMO, the body primarily attacks the optic nerves and spinal cord, resulting in inflammation that can cause severe pain and vision loss. In severe cases, NMO–also known as Devic’s disease—can invade regions of the brain or brain stem. Axtell said this grant offers an opportunity to study the origins of the disease and, along with his expertise in MS, to better understand the condition in order to identify molecular targets for therapies. According to the National Multiple Sclerosis Society, NMO affects roughly 4,000 Americans and it occurs 80 percent of the time in women. It also disproportionately impacts African-Americans. Currently there are no approved therapies for the disease, and Axtell would like to play a role in changing that. Axtell, an assistant member in OMRF’s Arthritis and Clinical Immunology Program, came to OMRF in 2013 from Stanford University. The grant, 1 R01 EY027346-01, is funded through the NEI, a part of the National Institutes of Health.